This morning, my aqua class left laughing and squeezing the shoulders of fellow classmates, rehashing the camaraderie of power walking with runway model-like posture, back and forth in the shallows of the pool. Building a sense of community is always a proud moment in a group fitness instructor’s portfolio, but what’s even better is being able to mine fundamental knowledge within a person that has been lost to years of neglect or focus. Raising two children has given me the chance to watch a human being develop, literally. The time that humans spend crawling in comparison to the time we spend walking is miniscule. Walking naturally becomes an unconscious endeavor that we just do. Certainly, I did not invest any time (not as of yet anyway) into my children’s gait; I simply waited anxiously like every other parent I know, awaiting their first steps. Walking, however, can be viewed metaphorically in comparison to using utensils. It’s simple enough to hand over forks and spoons to a child and allow them figure it out. Whether they refine their ability to eat with utensils is questionable. If you believe in a certain skill set for table eating, then you probably take the time to assist your children with the proper hand placement around a fork, spoon, and knife. You teach them how to position their hands and fingers around the knife and fork to cut a piece of meat or a vegetable. It’s not necessary that you do this, since the child will inevitably pick up on how to use utensils, though primitive their use may be. The same is true for their gait. An untended gait can lead to a suite of unnecessary physical ailments and ultimately lead to surgery, for example, hip and knee replacements. The time we invest in our children, or in ourselves, is key in staving off future injuries or undoing any underlying physical problems that are in development. First things first: find a mirror and have a look at your walk. Just walk naturally a couple of times back and forth to get yourself comfortable and dissolve some of the self-consciousness that comes from watching yourself. Once you have relaxed, look forward and try to watch your full body move forward (do this several times and change the pace), taking into account your hips, your foot placement, your arms, your head, neck and chest. Do your arms swing? Do your hips move with each step? Do your feet point in (pronate) or angle out (supinate)? The way we move our hips, our arms, hold our head, neck and shoulders, and the direction of our feet impact the way our body adapts to moving our muscles, the way our bones wear and tear, tendons stretch, etc. 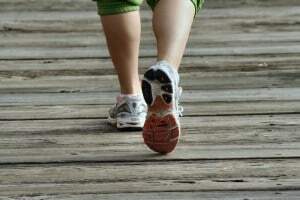 The gait is something that can be easily diagnosed and corrected. It helps to have a doctor, health practitioner, dance or other physical fitness professional to help you, but a mirror and some awareness will help you immensely. Many people these days have access to video recorders, especially on small devices or cell phones; recording yourself walking and including a progression of your gait can prove remarkably effective in improving your strut. Gait awareness and improvement can be included any time of day. You can begin at the sink while you wash dishes just by keeping your torso lifted, your pelvic floor (the muscles that control your bowels, frankly) contracted, your chest open and your toes pointing forward. Take that posture and transition it into a mobilized one by adding smooth hips, engaged scapulae (shoulder blades tucked down), soft arms, and toes pointed forward, legs crossing slightly one in front of the other. Gait enhancement is a practical way to warm down from a workout (cardio, strength/tone, or stretch). Experience the effects of revisiting the basic walk and feel the impact of your mind/body awareness resonate in all aspects of your life. That awareness is at the core of wellness.